Update March 2019: 1000+ downloads - Thank you! For two years we have provided nightly stock data so you can become more aware of daily market activity. Looking ahead this year, we are testing using sliders for certain data points instead of using our pre-selected segments. Email us to share other suggestions. Thanks again - good luck trading! 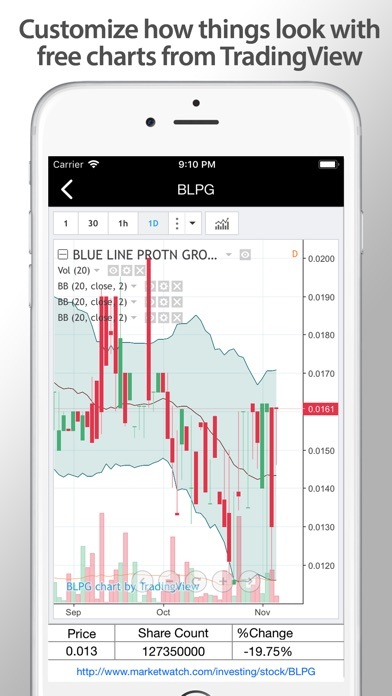 This app is a professional stock scanner with an interface even a beginner will understand how to use. As a real trader, I needed an app that monitored OTC, Pinksheet, NYSE, AMEX, and Nasdaq stocks from as low as .0001 up to $5 - but none met all my needs for reliable, nightly scanning of the days action. Many times while sitting around at night I felt a desire to check out the days action from my phone, but no app had every feature I wanted or needed. 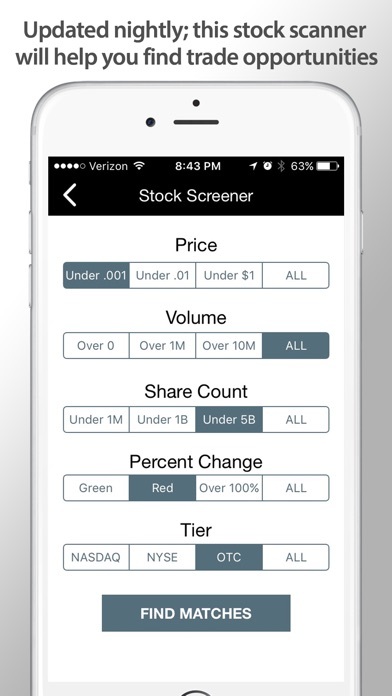 My goal was to create the best penny stock market screener app for traders looking to see what stocks may require more of their attention in the days ahead. Looking for the days biggest NYSE movers under $3? Check! Triple zero stocks? There's literally hundreds! Low float stocks? Find them easier than ever. There are over 3700 companies in our database. First, use the stock filter to narrow down by five important criteria: 1. Price under .001, under .01, under $1, or under $5 (ALL) 2. Volume over 0, over 100K, over 1M, or ALL 3. Share counts under 1M, under 1B, under 5B, or ALL 4. Daily Percent Change choose Green, Red, Over 100%, or ALL 5. Tier choose NASDAQ, NYSE, OTC, or ALL You then hit 'Find Matches' and instantly see a list of tickers that fit your criteria. The results are displayed in a sortable table (another must-have). Sort by price, symbol, percent change and more! You can also click on a result to view an interactive chart provided by our favorite stock chart website. There are over 35 technical indicators as well such as Moving Averages, Bollinger Bands, RSI and many other technical analysis strategies. Thank you, TradingView.com When available, recent press releases will be listed under the NEWS tab. Looking into adding more news sources next. 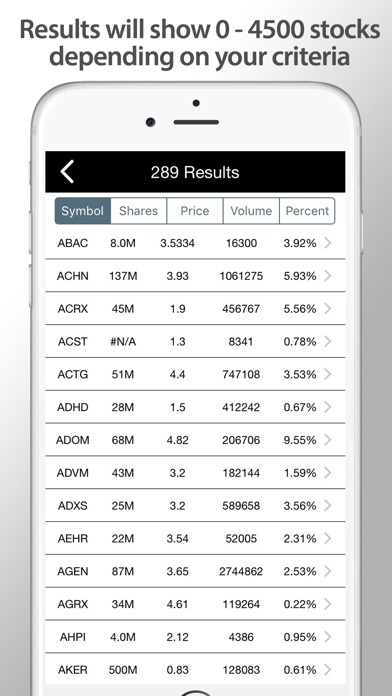 This app is meant to be a research starting point on potentially active stocks. 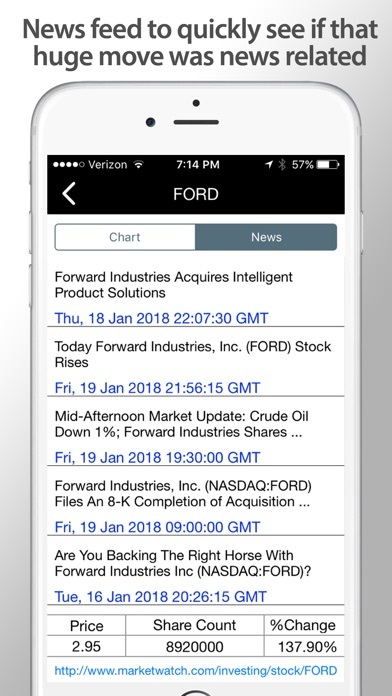 I use this app daily and truly believe it will put stocks in front of you that you may not have normally seen, as it does for me. Even if I learn why just ONE stock was up that day, I see value in this application. Pricing may change to a monthly subscription model in the future. Existing users will always full access if any pricing changes were made. Market data like price, volume, and percent change is updated between 4:00PM and 6:00PM EST every day. This app does not provide live quotes; idea was explored but the number of data requests from an exchange would more triple app price. Share structures are updated monthly due to the sheer workload required to acquire this info. Disclaimer: We are not a registered investment advisor. This app is not to be considered investment advice. Data is for informational purposes only. We have no affiliation with any public entities. We have no affiliation with Nasdaq, NYSE, AMEX, OTCM, or any other market exchange or firm. All logos belong to their corresponding companies. Read disclaimer within app for more information. Share counts are typically AS for OTC, OS for Listed. This app has been pretty good but just recently it stopped providing any data for OTC markets. Loved that I could sort by share structure. But now it no longer is useful to me. 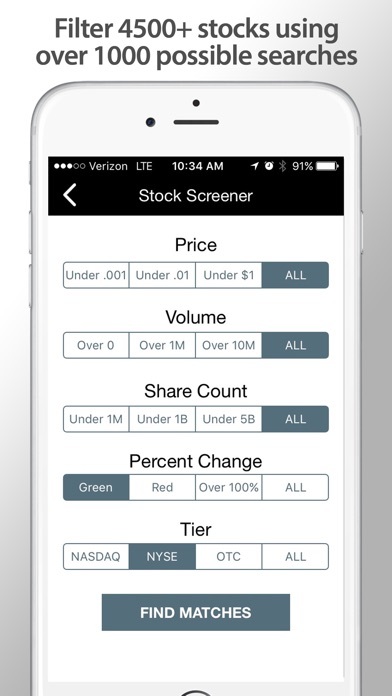 the stock screener they use is something you could see in finviz. its stupid on my part that i thought its live stock scanner. wasted my 4$ here. There’s not much filters and the app crashes every time you try to load a chart. 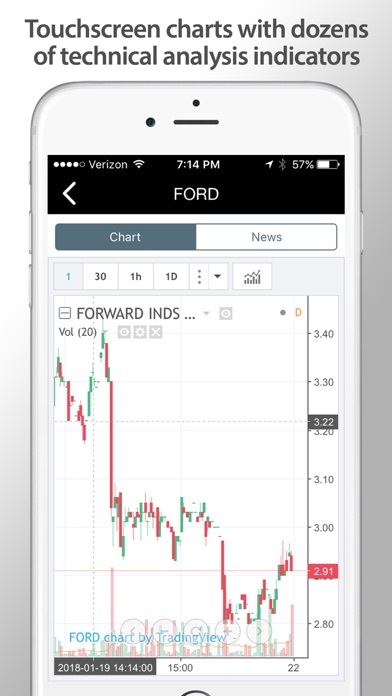 I am a new trader and like this app but it crashes when I click a stock to see the chart/news screen. Fix this problem and I will give 5 stars. When it crashes I have to go back and scan again and find where I left off. I am on an iPhone X in the US. I like the concept of simplicity but the lack of enough filtering options produces too many tickers to manually sort out. The idea of a screener is to save time by narrowing down the results if needed. Add more filtering options ( between, greater than, etc)and this would likely sell better and be more valuable. This could be done and still maintain the simplicity. 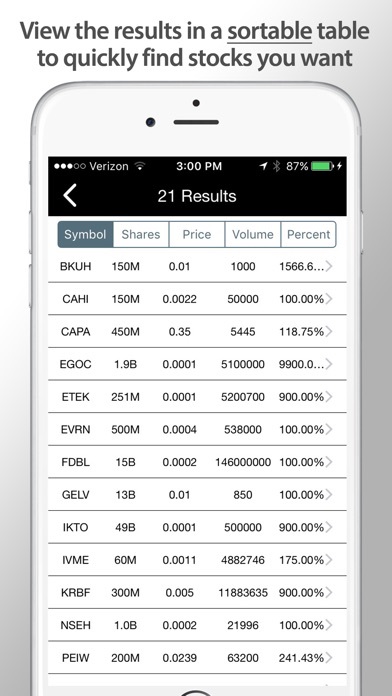 I daytrade for a living and this application makes it very easy to see what stocks stand out each day. Usually youd have to pay 50-200$ for something like this. Would reccomend! App does what it’s suppose to do. Updates daily after market hours. Made good money first time I used the app. Definitely worth the money. Great job!